While analyzing medical images shared during a healthcare video conference, doctors, medical students and/or patients need an efficient way to point out the image details being discussed. Recently, the Arizona Telemedicine Program (ATP) and its subsidiary, the Southwest Telehealth Resource Center (SWTRC), based at the University of Arizona Medical Center in Tucson, AZ, invited Boeckeler Instruments to demonstrate the Tucson-based company's latest video marker. 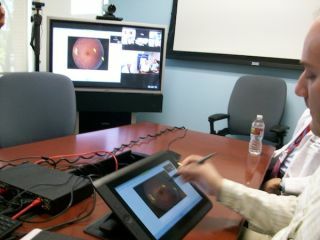 Boeckeler exec Brent Tremblay annotated a photographic image of an eye that was displayed on a laptop and transferred to a Pointmaker video annotation system (left-hand unit on table) and a Wacom DTK-1300 pen-enabled display monitor. The image with annotations was then transmitted to the codec and distributed to all teleconference attendees. According to Brent Tremblay, if a Pointmaker system was also on the receiving end, participants on that end could annotate images. Alternatively, multiple users in a conference could use their iPads to annotate shared images if they've downloaded an Engage Pointmaker app ahead of time and logged into a special meeting code set up by the conference facilitator. He says the Pointmaker CPN model is capable of receiving up to nine inputs and scaling composite, Y/C, RGB, YUV, and HDMI signals to high resolution formats up to 1920 x 1200. This model can also capture the annotated images and send them to a printer or USB storage devices for later sharing. The ATP and SWTRC are dedicated to advancing the effective use of telemedicine services throughout the Southwestern U.S. by assisting with start-up telehealth programs and providing resources for existing programs in technology and other issues affecting telehealth in the region.